Airbus reached a milestone with the delivery of its 30th A380 superjumbo, the 7th so far this year, and said it was on course to reach a target to deliver at least 20 in 2010. 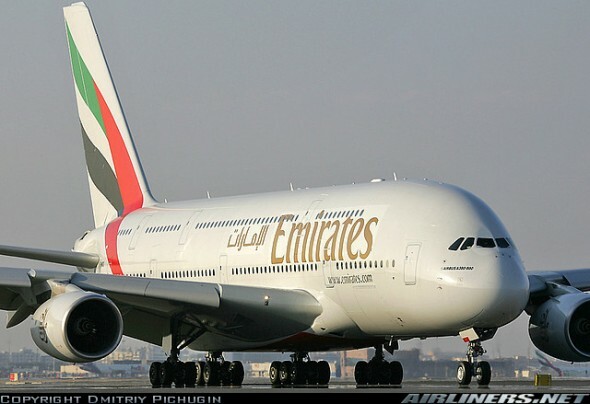 The latest A380, worth $346 million at list prices, became the 10th superjumbo in the fleet of Dubai-based Emirates, which is the plane's biggest customer with a total of 58 orders. Airbus faced delays and increased costs in production of the world's largest airliner due to previous wiring installation problems and heavy customisation. Les Echos website reported earlier this past Friday that Dubai government-owned carrier Emirates planned to order 12 more A380s and place 18 options on the aircraft at the Berlin air show next week. The Berlin show does not usually see major orders, with airlines traditionally preferring to make announcements at larger air shows such as Farnborough and Le Bourget in England and France, which take place on alternate years in July. Emirates, which has $55 billion in orders with Airbus and Boeing, said in May it would take delivery of seven A380s and one Boeing 777 in 2010-2011 and that it planned to announce new aircraft orders, likely at Farnborough next month. Airbus sales Director John Leahy last month doubled the planemaker's target for A380 sales this year to more than 20, saying a rebound in passenger traffic pointed to resilience in the world economy. Airbus has found buyers for a total of 202 A380s but critics say the 525-seat plane, which entered service in 2007, has sold relatively poorly compared to upcoming mid-sized models because it is restricted to flying between large intercontinental hubs.